Pineapple is a sweet, delicious treat for anyone to enjoy. The flavor just can’t be beat! Though it is protected by a spiny exterior, it’s now easier than ever to enjoy a fresh slice, whether you eat it raw or toss it on the grill. When you shop for one at the grocery store, be sure to look for a pineapple that is firm but not hard, with a deep orange/yellow tone. 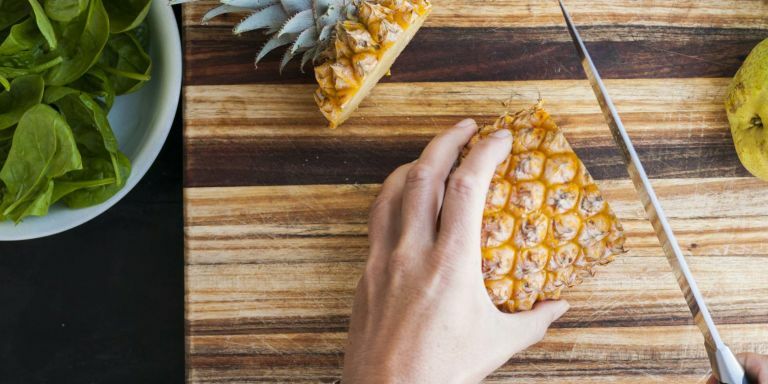 There are quite a few methods to cut and serve your pineapple. Use a sharp chef’s knife or a knife with a serrated blade. Trim off the top portion while being careful to avoid the stiff and pointy leaves. Next you’ll trim the bottom, so you can stand it upright. After that, slice down the sides, being sure to cut off the outer skin and spines. Continue this all around the pineapple being sure to follow the natural curves of the fruit. Now you’re free to cut the pineapple into chunks or slices. For rings, cut the pineapple width-wise. Take a small cookie cutter and chop out the inner core. Feel free to discard these, or eat them! For hearty chunks, cut the pineapple lengthwise around the core to your desired thickness. For chunks, cut each piece lengthwise one more time and then dice crosswise. You’re free to serve up your pineapple!